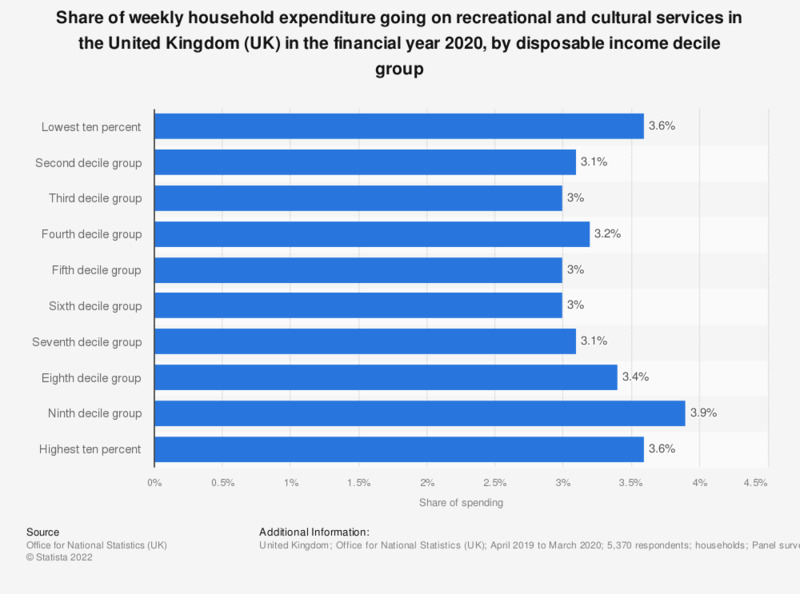 This statistic shows the percentage share of total weekly household expenditure going on recreational and cultural services in the United Kingdom (UK) in the financial year ending 2018, by disposable income decile group. Households in the ninth decile group spent an average of 4.1 percent of their weekly household expenditure on recreational and cultural services, which is the highest among the disposable income decile group. ** Recreational and cultural services include: sports admissions, subscriptions, leisure class fees and equipment hire; cinema, theatre and museums etc. ; TV, video, satellite rental, cable subscriptions, TV licences and the internet; miscellaneous entertainments; development of film/photos, passport photos, holiday and school photos; gambling payments.